Shiny Starter. 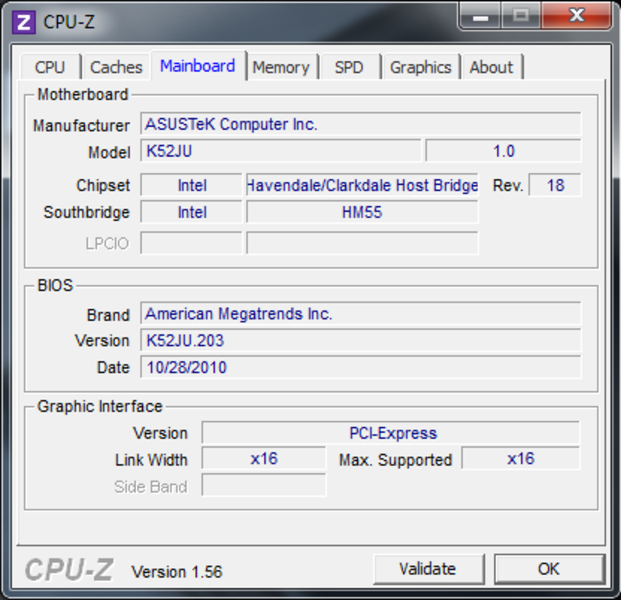 An Asus entry-level model with an Intel Pentium processor and a current AMD entry-level graphics card. Lots of performance for little money? What about the sturdiness of the case, the display and the battery life? We've got the answers. 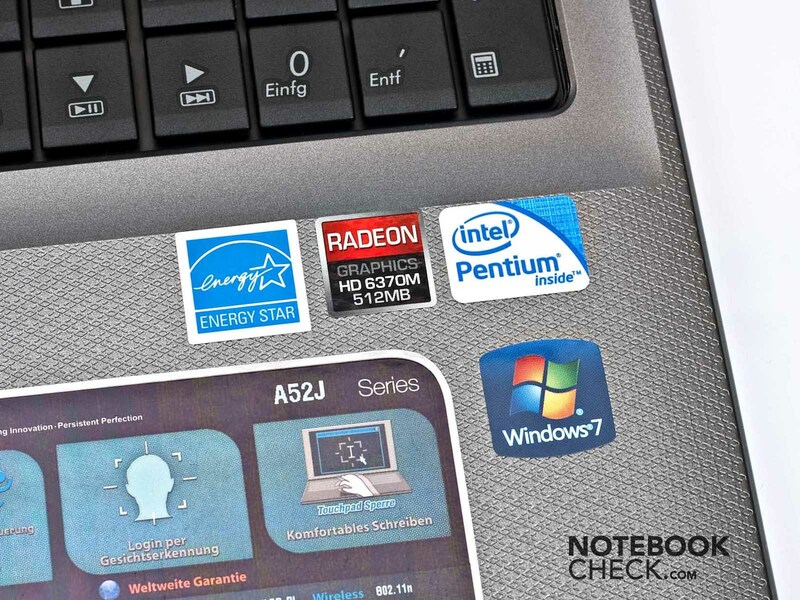 With the A52JU, Asus brings to the market a well-rounded entry-level laptop. 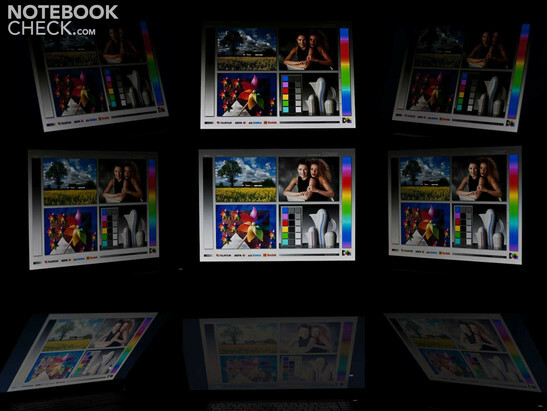 The notebook covers a broad scope of uses and is available at an attractive price under 500 Euro. 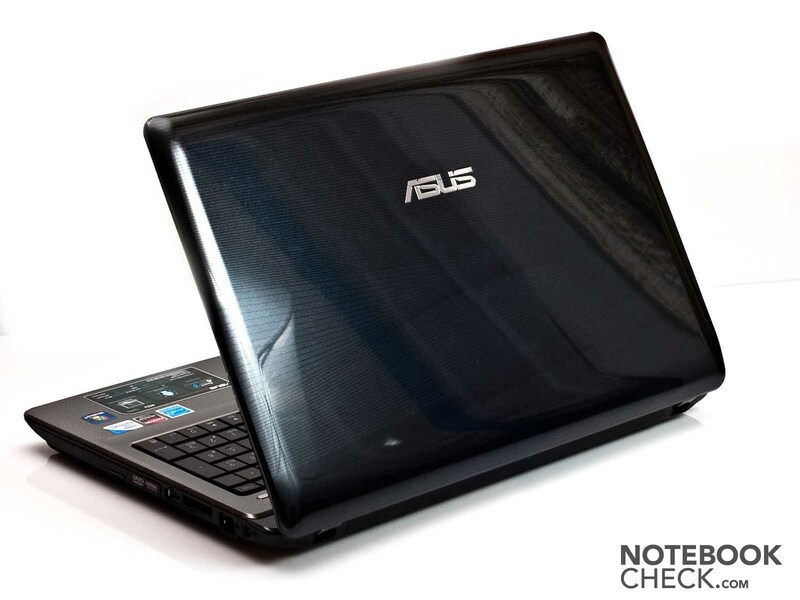 In addition to features like Palm Proof and Power4Gear technology, Asus claims the Intel Pentium P6100 processor and AMD Radeon HD 6370M graphics card ensure the notebook's high level of performance. But what is the notebook really capable of? And does this inexpensive, well-rounded starter notebook have a sturdy build? We ran the necessary tests to find out. The A52JU's case surface mostly consists of high-gloss plastic. The entire display lid and several other parts have a shiny plastic finish. On the one hand, this looks quite nice but, on the other hand, fingerprint marks and smears are very noticeable. The design looks sophisticated and well put-together. The glossy surfaces fit in well with the design as a whole. Small details like the thin horizontal lines worked into the display lid lend a nice touch. The display lid, moreover, seems to have special sort of finish to it. In direct light tiny spots sparkle in all the colors of the rainbow. In our pressure point tests, the A52's plastic case comes out average. Pushing down on the closed display lid results in the surface noticeably caving in. The palm rest, on the other hand, could not be any sturdier. Even under heavy pressure, it doesn't give a millimeter. All in all, the inside is built very sturdy. The right part of the keyboard likewise gives in very little or not at all to pressure. The further left we go, however, the more the keyboard gives in as we push. Pressing in the back of the display lid with very little effort results in it bending a bit. The colors on the screen, however, remain undistorted meanwhile. The Asus A52JU is a minimalist in terms of ports. You'll have to make do with the most basic inputs and outputs and nothing more. 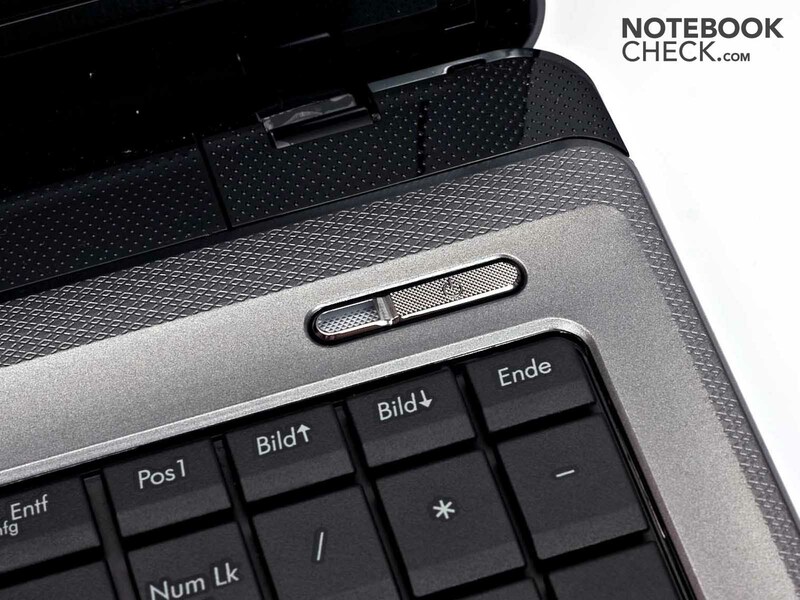 With a total of three USB 2.0 ports, the notebook does not offer many options in the way of attaching external devices. For an external mouse, hard drive and printer, the ports do suffice, though. Note that a large USB plug might end up blocking the second USB port on the left side, or the CD/DVD tray on the right side. 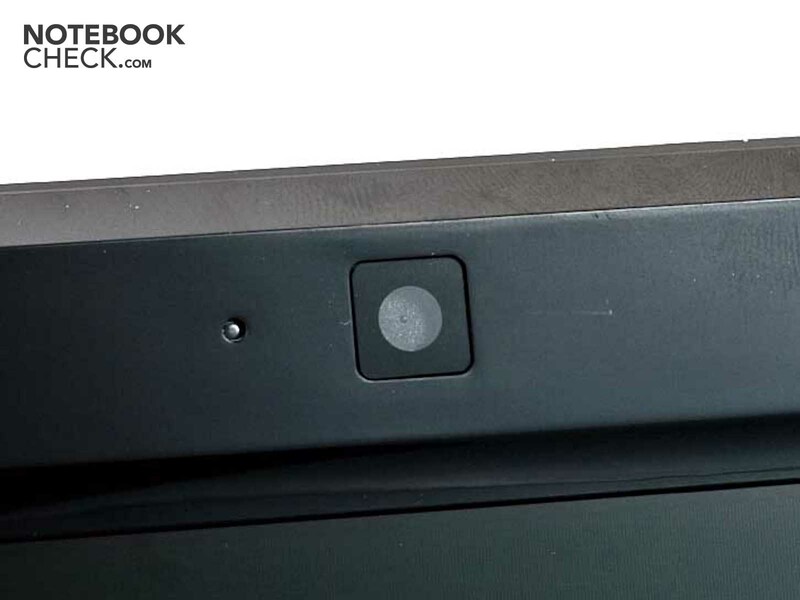 On the left side of the notebook, you'll find a Kensington Lock slot, a VGA output, an HDMI output, two USB 2.0 ports as well as the microphone input and the headphone jack. On the right side, there's the optical disc drive, another USB port, the 4-in-1 card reader (MC/SD/Memory Stick (Pro)), the RJ45 Ethernet port and the power connector. The front and back of the notebook are completely free of ports. Considering the placement of ports, right-handed users at least should not feel obstructed by connected devices. Since most ports are located on the left side, there should easily be space for a mouse at the right. The only way the Asus A52JU can be connected to the outside world is via Ethernet or WiFi, Bluetooth is not included. Still, the Gigabit LAN network connection is quite fast and WiFi signals are sent and received on the 802.11 B/G/N Standard. As you might guess from the low price, Asus A52JU does not come with a lavish set of accessories. Other than the notebook and the power supply, you'll only find a booklet concerning the warranty and a sort of user manual. The Asus A52JU comes with a 12-month Collect and Return warranty. Asus was generous enough to fit the A52JU with a number pad. The bottom part of each key slopes slightly downward, making it easier not to hit the wrong key. At dimensions of 17 x 17 mm, the individual keys are quite large. A typical desktop keyboard's keys measure 19 x 19 mm. The number pad at the right side of the A52JU should bring some joy to those hard workers constantly filling in charts and cranking out numbers. Typing is very comfortable on the Asus A52JU, thanks to its large keys you'll always hit the one you mean to. Although it might feel good, it sure doesn't sound very good. The keys make a crinkling sound as you type. The mechanism underneath the keys either bobs up and down upon typing or sits a bit askew since sounds are heard coming from there as well. What's more annoying than the noise during typing is the poor responsiveness of certain keys. While typing quickly, we observed that some keystrokes simply go undetected. The "Y" key, particularly, didn't register quite often. 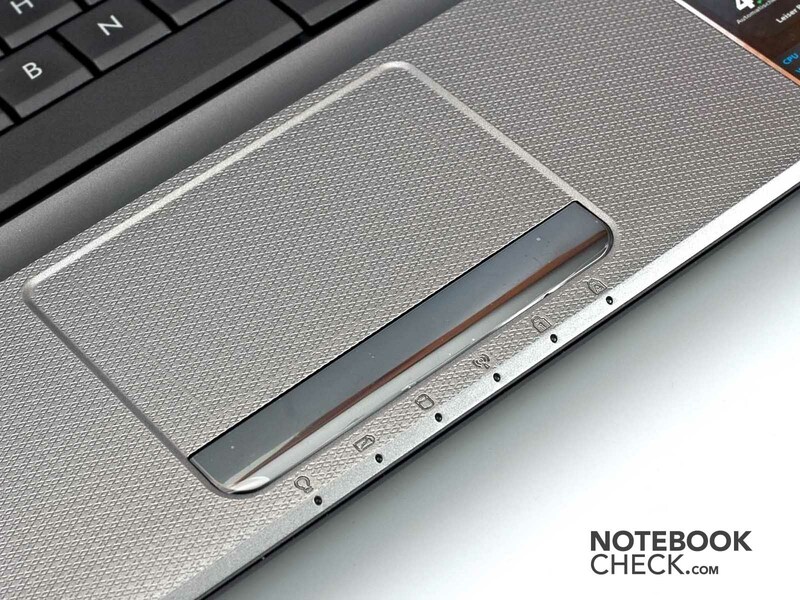 The touchpad approximately measures a generous 85 mm diagonally. 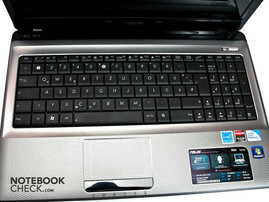 At first you might assume that the touchpad is comprised of the entire recessed surface above the large touchpad keys. 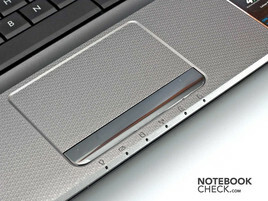 Upon closer inspection, however, you'll find a thin borderline encompassing the actual touchpad. The touchpad settings do not allow you to use the space outside this border for vertical or horizontal scrolling, although that can be done through multitouch gestures. This means that you can scroll through documents or websites using the typical two-finger scroll (horizontally or vertically). The touchpad can, moreover, recognize whether it is your fingers or your palm that's sliding across the surface of the touchpad. So, while typing you won't need to worry about accidentally selecting a different part of the document because your palm slides over the touchpad. 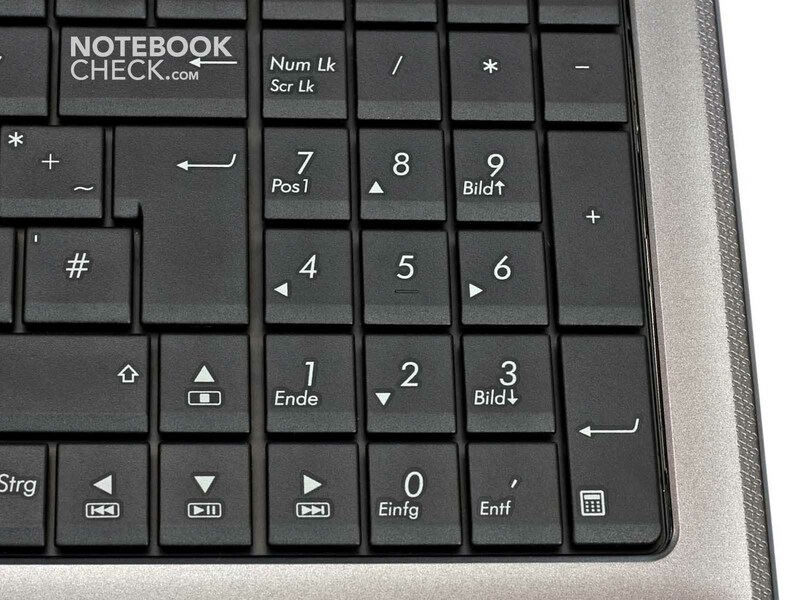 The separate left and right touchpad keys come in the deceptive form of a single key. This key is raised to a good height above the surrounding palm rest and the pressure needed to click is just right. Asus went with a resolution of 1366 x 768 pixels for the 15.6" display. The aspect ratio of 16:9 has become the standard with displays of this size. The screen is glossy, making reflections show up on the screen near light sources or outdoors. 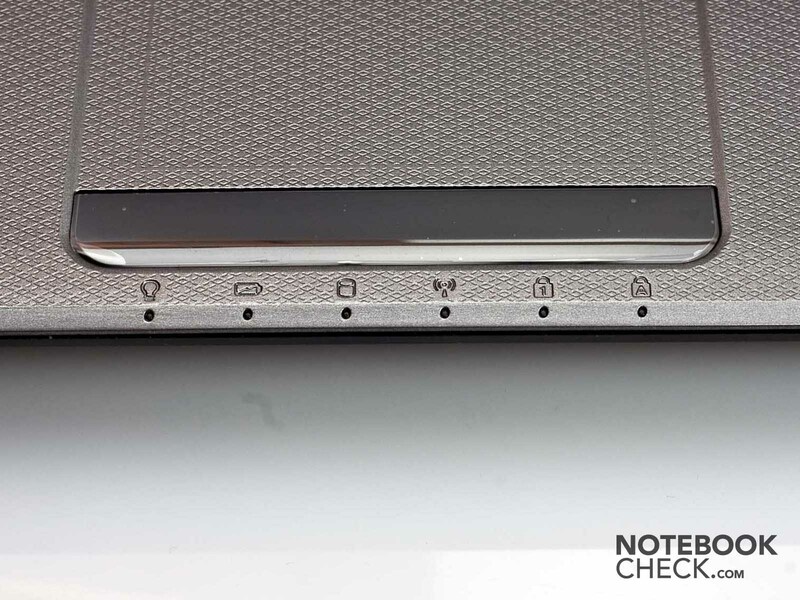 The glossy screen also makes it easier to see fingerprint marks on it. At a black level of 1.01 cd/m² (center), the display of the Asus A52JU only manages to produce the modest contrast ratio of 156:1. The average screen brightness of 165.3 cd/m² is quite low. Other laptops in this price range usually reach an average screen brightness of around 200 cd/m² (for example, the Lenovo B560, average brightness = 195.3 cd/m²). Even the maximum screen brightness of this notebook is surpassed by the average brightness values of some laptops. Its brightness distribution of 82% doesn't give the Asus A52JU anything more to brag about. The display in place here doesn't even come close to accurately reproducing the color space of Adobe RGB or sRGB. 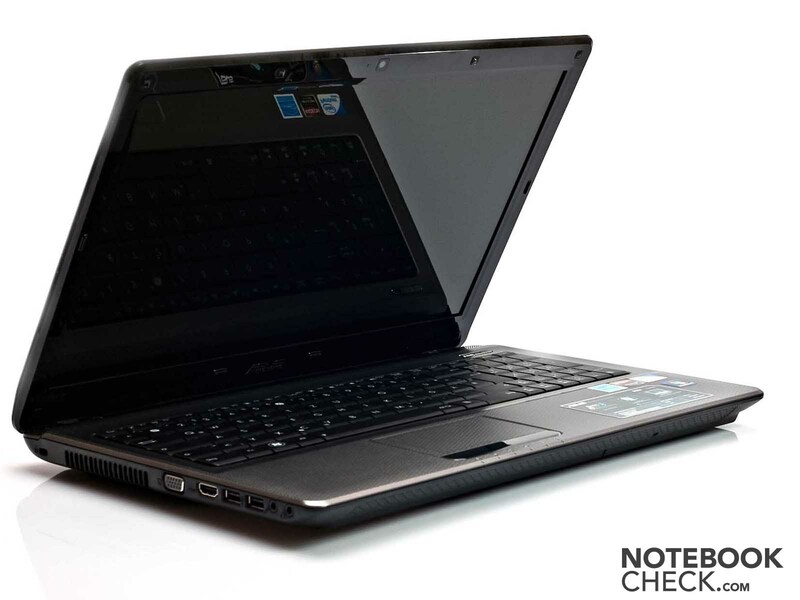 Even compared to the Asus P42JC, which we recently reviewed, the A52JU still draws the short straw. The Asus A52JU is only suited for outdoor use on very cloudy days. The glossy, reflective screen and the low brightness render it difficult to make out the contents on the screen. It's best to find a shady place if using the Asus A52JU outdoors. In terms of its viewing angles the Asus A52JU is no miracle. Tilting the screen 10º or more away from the ideal viewing angle quickly results in a distorted picture. Looking from the left or the right of an ideal viewing angle, you have some wiggle room up to 45º before the screen contents start to look distorted. 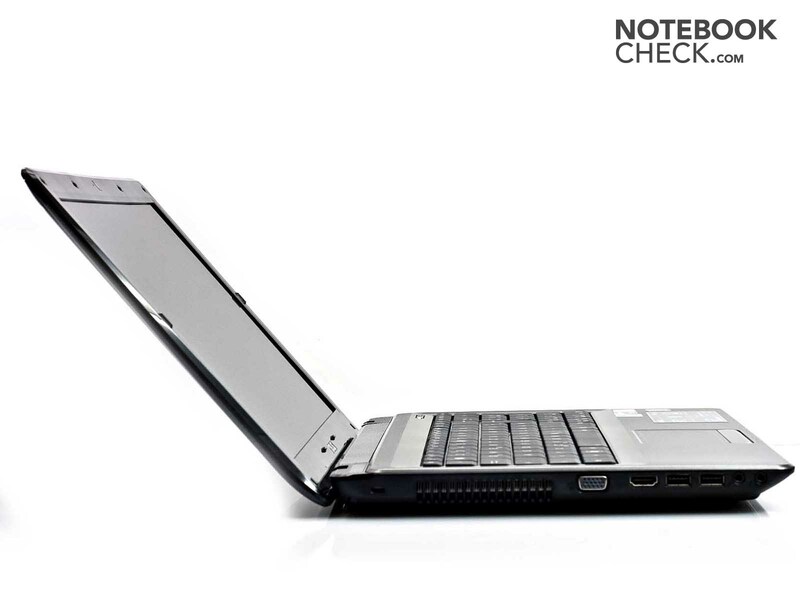 The Intel Pentium P6100 Processor is a still relatively young processor for starter notebooks. 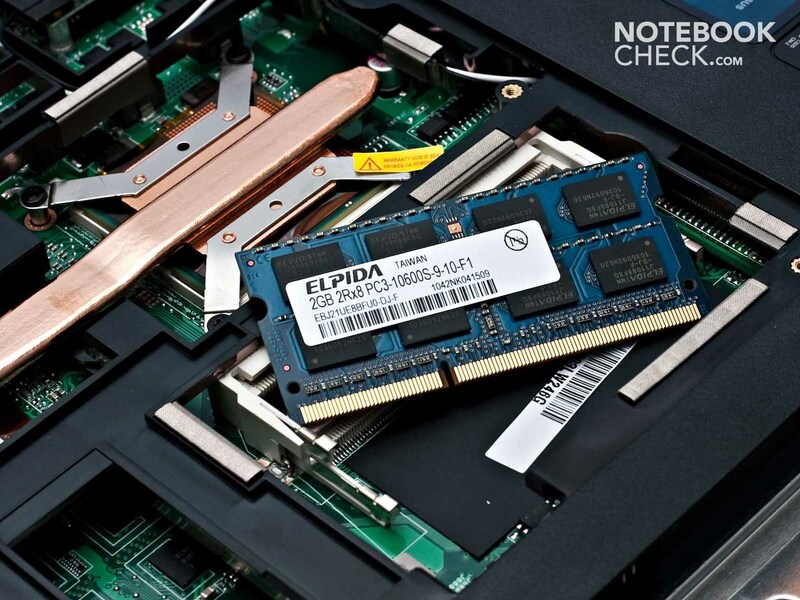 This dual-core CPU doesn't really impress with its processing power but offers a good overall package for inexpensive notebooks. Included is an on-board Intel HD graphics card and memory controller. 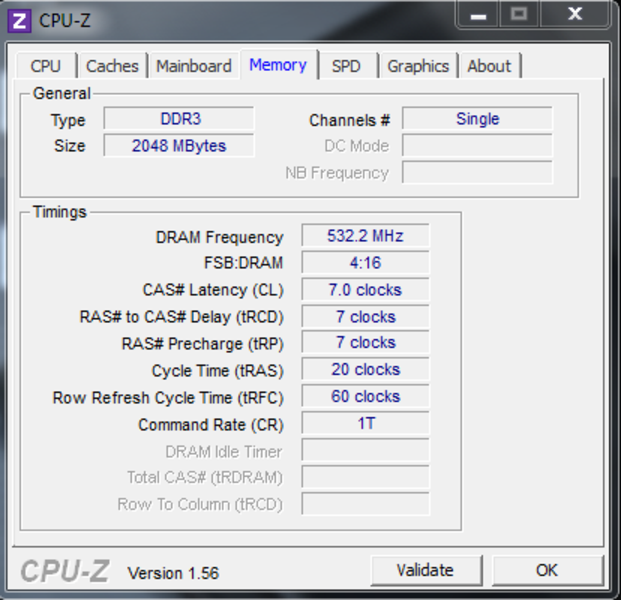 Both cores run at 2.0 gigahertz (GHz). The P6100 has an Arrandale core like the i3, i5 and i7 models but has to do without the Turbo Boost function. 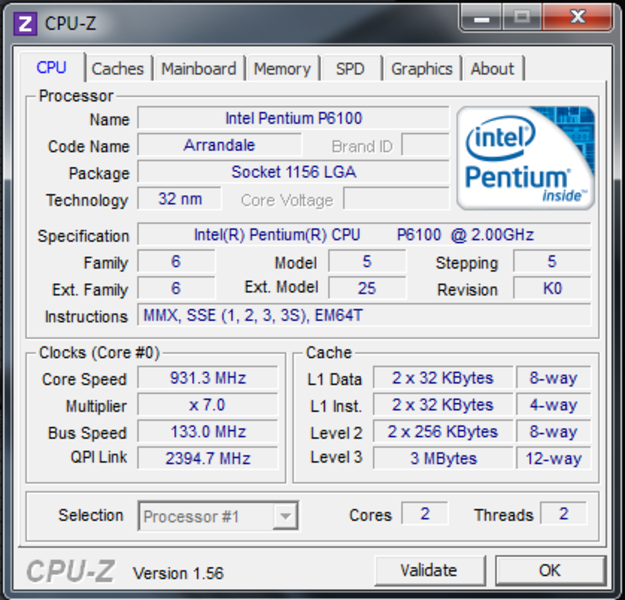 The Intel Pentium P6100 has a TDP (thermal design power) of 35 watts. Like before with Intel processors, the AMD Radeon HD 6370M graphics card here is one of AMD's new starter GPUs. If you're wondering about the name, the ATI brand name has been removed by AMD from their products. In terms of performance, the AMD Radeon HD 6370M graphics card is based on the ATI Mobility Radeon HD 5470. 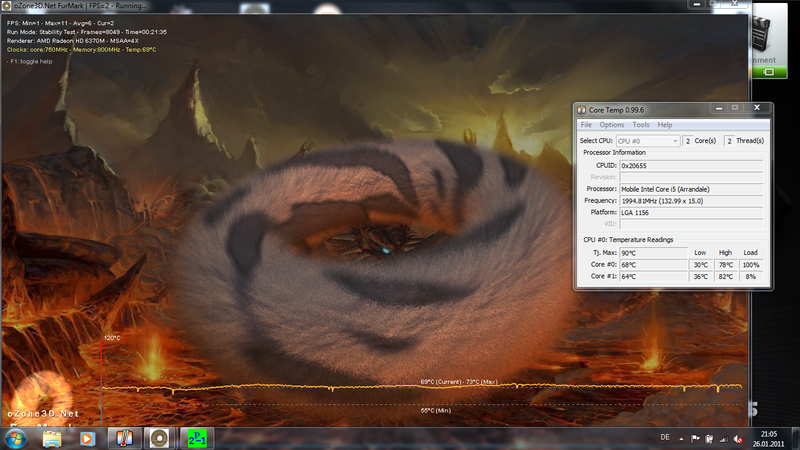 Other than having the same number of shaders, 80, the AMD Radeon HD 6370M also supports DirectX 11. 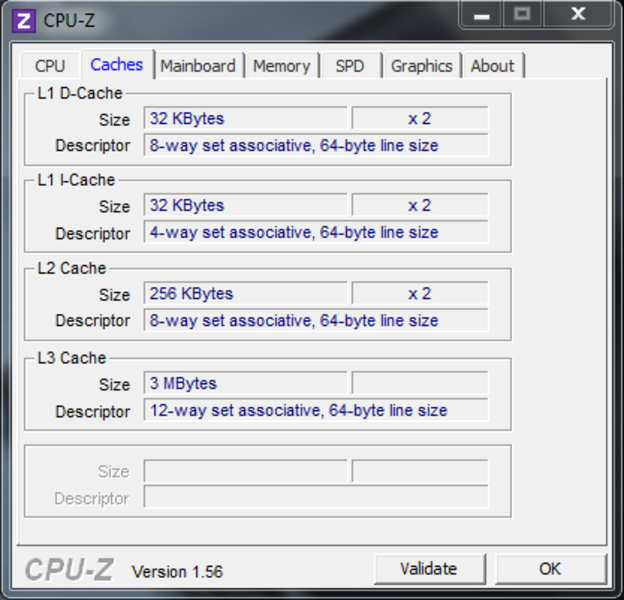 For decoding HD videos, the AMD graphics card also has a UVD2 video processor in its tool belt. 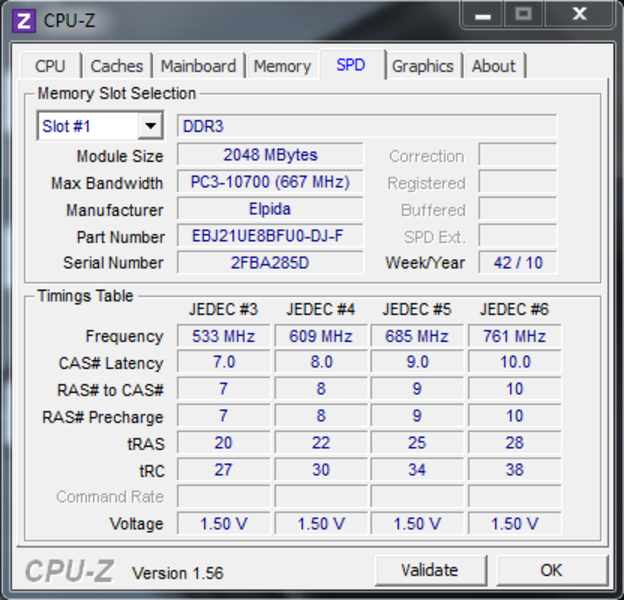 When it gets into gear, the AMD Radeon HD 6370M uses up a mere 8-15 watts (TDP). In return, you shouldn't expect outstanding performance from the GPU. Recent games run—if at all—only at the lowest detail settings. Less demanding games can be run at a decent frame rate with moderate graphics settings. 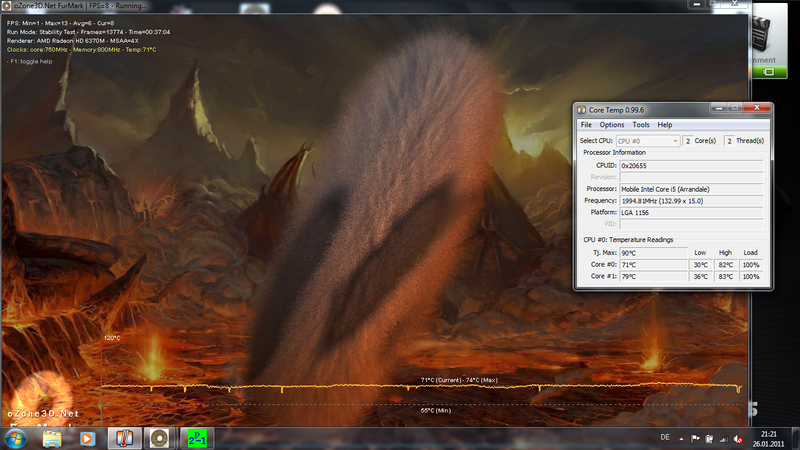 According to the Windows Performance Index, the Asus A52JU functions quite well on the whole. 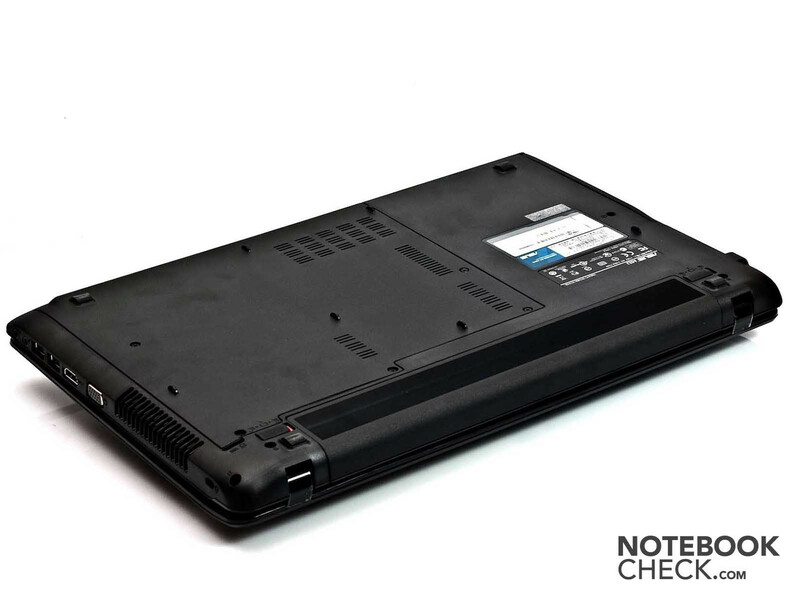 With an overall score of 5.0, our test notebook manages to pass up several of its competitors. 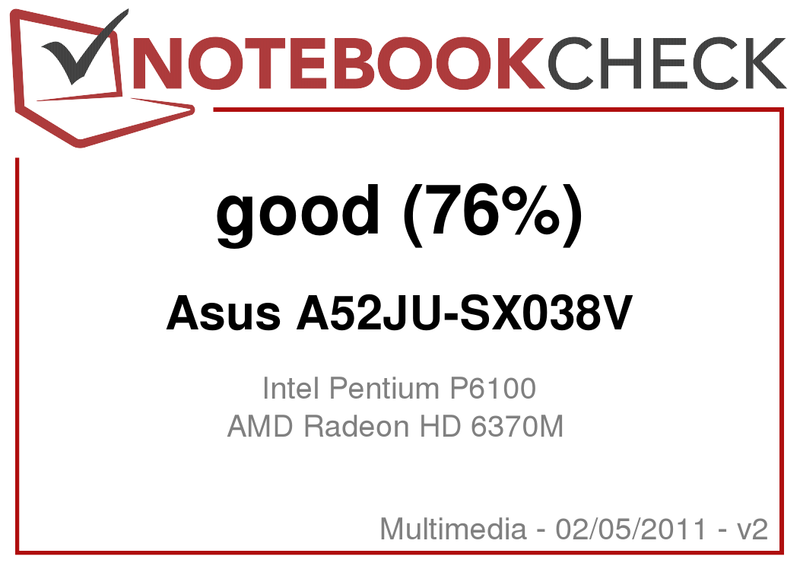 The notebook really scores some points thanks to its AMD graphics card. 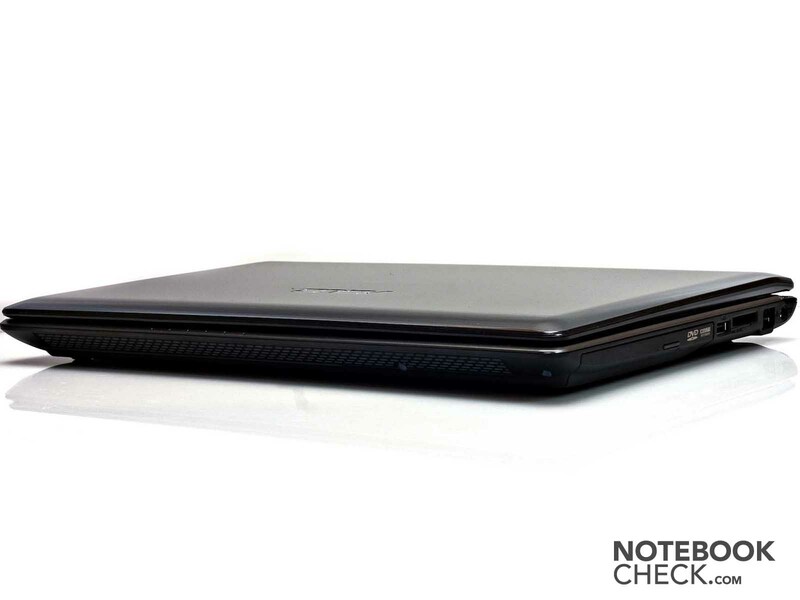 The comparable Toshiba Satellite C660-10E earns a score of only 4.5 points. In the CineBench and PCMark benchmarks, the Asus A52JU's score places it in the bottom third of our ratings board. It's PCMark rating places it directly below the Toshiba Satellite C660 with the same processor but a different, Intel HD graphics card. In the graphics test of the Cinebench benchmark, the Asus A52JU snags a spot above the Lenovo B560 and the Toshiba Satellite C660. These notebooks, however, are just about evenly matched with regard to processing power according to the CPU test. In the 3DMark benchmark, the Asus A52JU really gains some ground thanks to its graphics card. 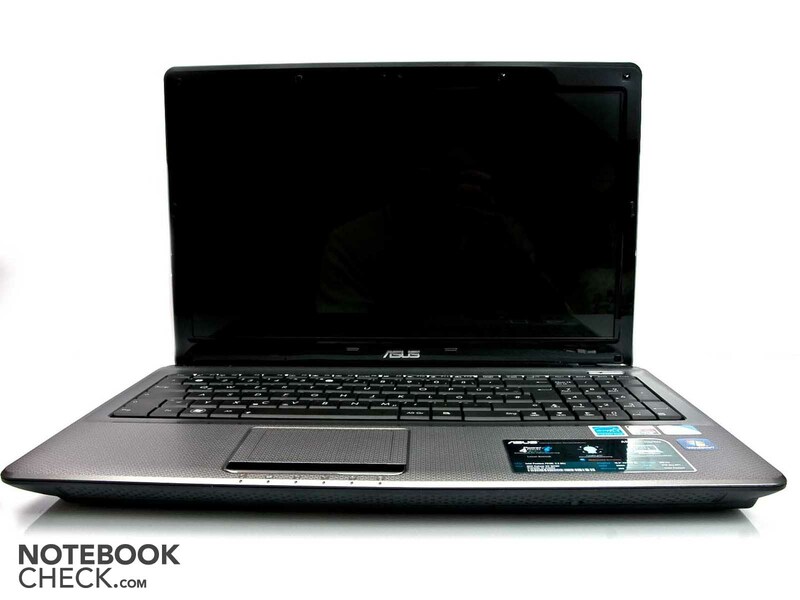 The AMD Radeon HD 6370M ensures that the Asus notebook gets ahead of the competition. 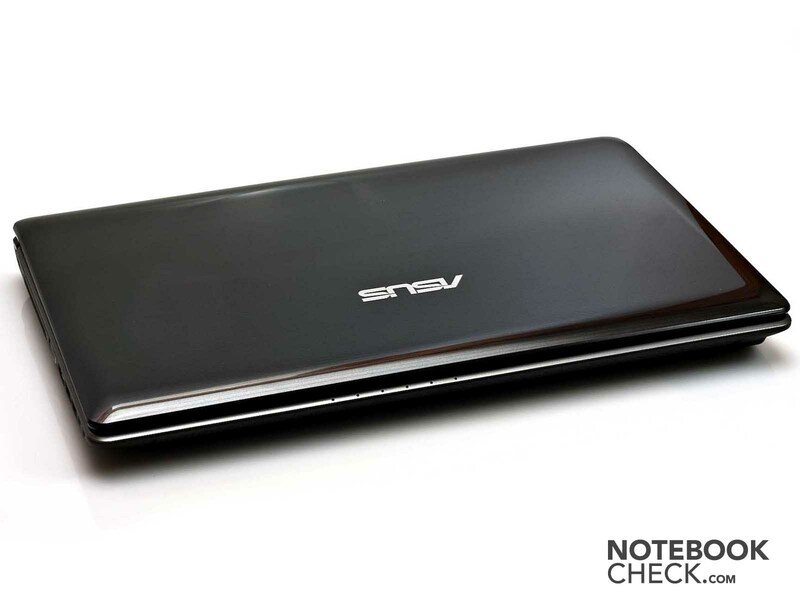 No other notebook with the Intel Pentium P6100 Processor has earned such a high score in 3DMark as the Asus A52JU. The Seagate hard drive in place here has a storage capacity of 320 GB. It's rotational speed of 5400 RPM doesn't give it the fastest access times (19.7 milliseconds). The average transfer rate ranks in below the mean at 52.1 MB/s, approximately 10 MB/s than comparable models. 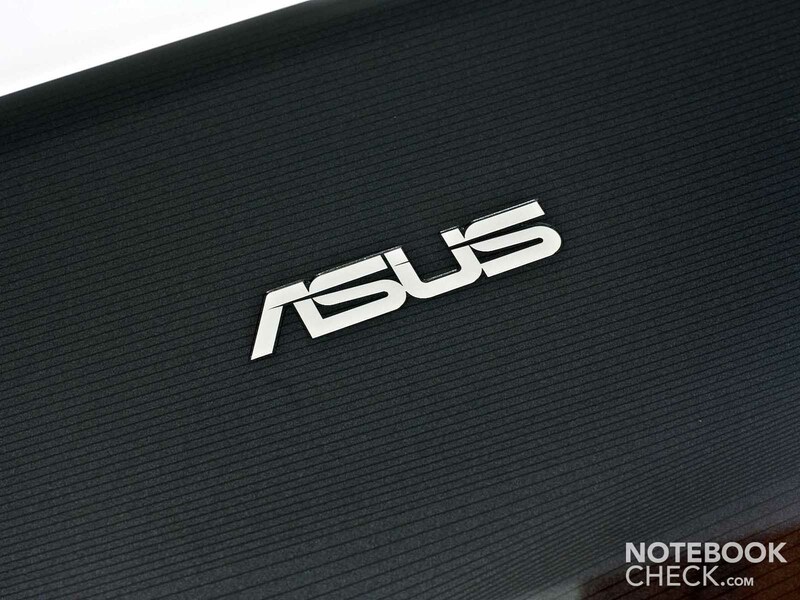 In the games we tested, the Asus A52JU doesn't do bad at all. The first-person shooters Call of Duty: Black Ops and Battlefiled: Bad Company 2 remained playable in low and even moderate detail settings. Only with higher graphics settings did the picture start to look choppy. Even StarCraft 2 runs smoothly with low detail settings. 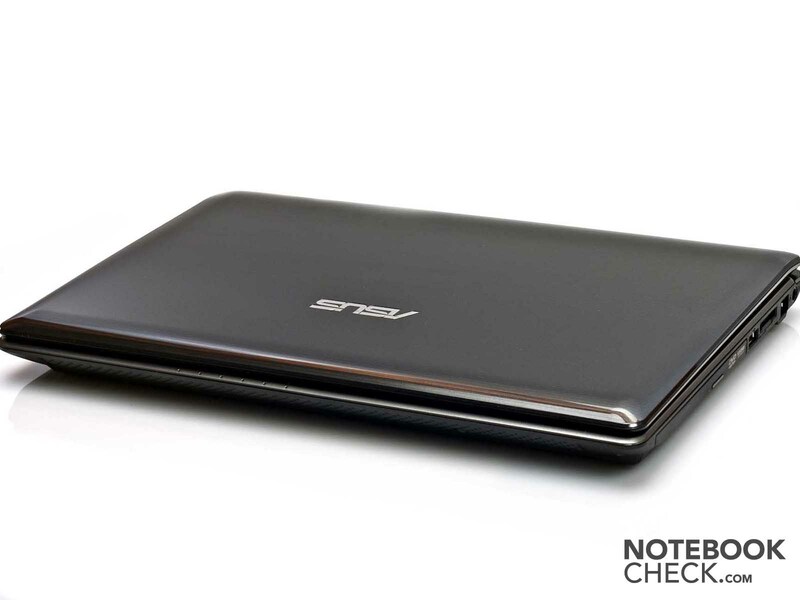 In terms of noise production, the Asus A52JU keeps it to a minimum. In idle mode, the fan runs constantly but the noise level remains between a very low 32.3 dB(A) and 32.6 dB(A). The notebook does remain audible at this level but in no way distracting. 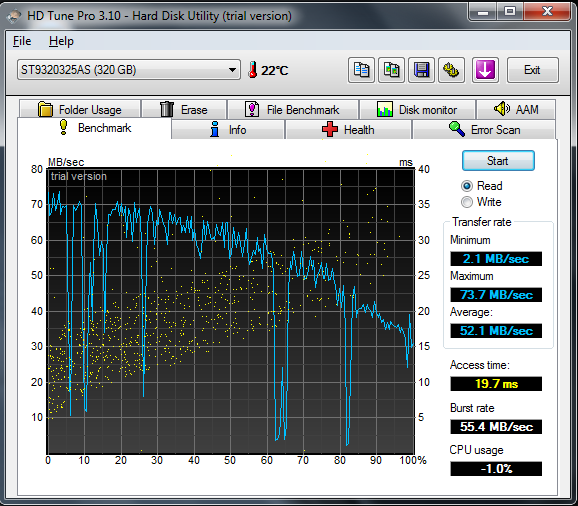 Under heavy use, the fans kick the noise up a notch to 34.4 dB(A). After prolonged heavy use, it rises some more 39.6 dB(A). There are no whistling condensers or other noises, only the rustling of the fan and occasionally the humming of the hard drive are audible. Music or the audio in films can only be overshadowed by the noise of the DVD player. 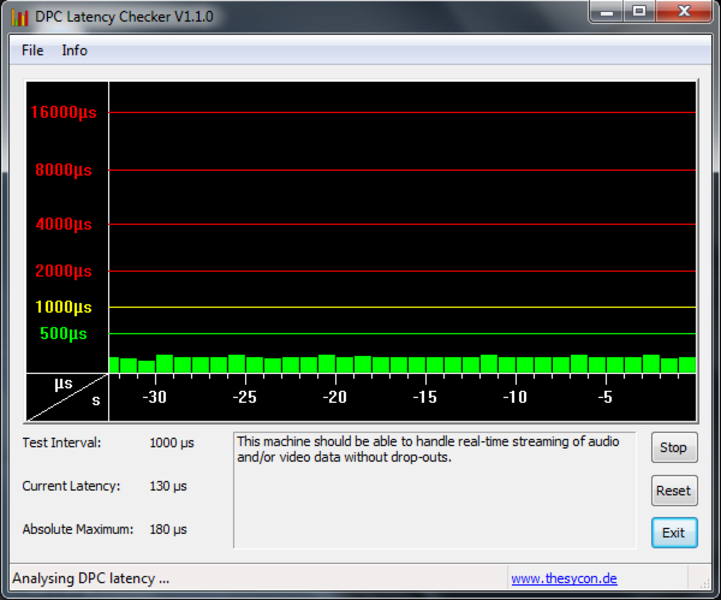 Watching a DVD film, the noise level remains within bound at 35.5 dB(A). But reading other data off a DVD, the disc drive really gets to work, bringing the high noise level of 47.6 dB(A) with it. The Asus A52JU always keeps a cool head about it. Under heavy use, the hottest point on the base plate reaches 36.0ºC. All other temperature values measured were under 30ºC. This notebook is, therefore, the ideal candidate for surfing the internet while basking the rays of the sun. Who likes short shorts? If you do, you can still keep the notebook on your lap with no fear of getting burned. In idle mode, especially, you have absolutely no reason for concern about the case getting too hot. During our stress test (with Prime95 and FurMark) we noticed that the fan became suspiciously quiet in the middle of the test. After further observations, we determined that that the maximum load of one of the processor cores dropped by a few percent. It seems that there's a regulatory mechanism here to keep the temperature of the processor within bounds. As soon as the CPU temperature reaches about 82ºC, the CPU load drops down to the single digits. Once the temperature falls to 65ºC, the core gets going again. (+) The average temperature for the upper side under maximal load is 26.2 °C / 79 F, compared to the average of 30.9 °C / 88 F for the devices in the class Multimedia. (+) The maximum temperature on the upper side is 28.7 °C / 84 F, compared to the average of 36.5 °C / 98 F, ranging from 21.1 to 71 °C for the class Multimedia. (+) In idle usage, the average temperature for the upper side is 25.6 °C / 78 F, compared to the device average of 30.9 °C / 88 F.
(±) The average temperature of the palmrest area of similar devices was 29.1 °C / 84.4 F (+1.6 °C / 2.9 F). The quality of sound produced by this notebook is surprisingly good for its price. The audio remains clear and still sounds good at high volumes. Only when cranked up to the maximum volume did we occasionally hear some distortion. The bass is not all too present, but mids and highs sound pretty good. ALTEC Lansing can take the credit for bringing the noise. Of course, the sound quality doesn't come close to that of a good multimedia notebook, but once again, for this price range, it's a catch. In Battery Eater's Readers Test (min. display brightness, energy-saver profile, WiFi off) the 6-cell battery in the Asus A52JU holds out for 2 hours 45 minutes. In the Classic Test (heavy use) the battery squeezes out one hour. So, if you don't push the notebook to the max while on the go, it should last for a good while. To charge up the battery all the way, it takes 1 hour 40 minutes. 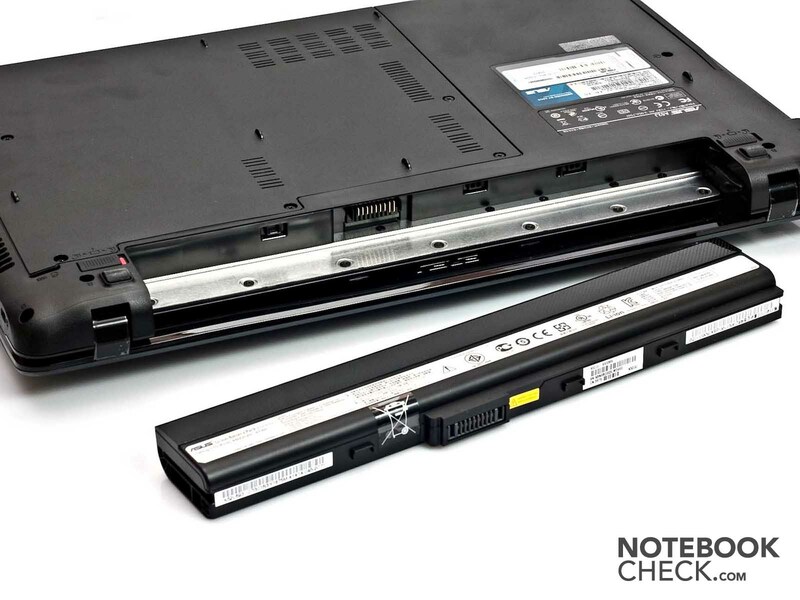 When watching a DVD film on the Asus notebook, you'll most likely be able to finish it considering that battery dies after 1 hour 56 minutes. For example, we got to relax and watch "The Transporter" all the way through on battery power. As you might have guessed from its battery life, the Asus A52JU is quite energy-efficient. In idle mode, it eats up between 17 and 21 watts. Under heavy use, its energy consumption rises to a maximum of 58 watts. 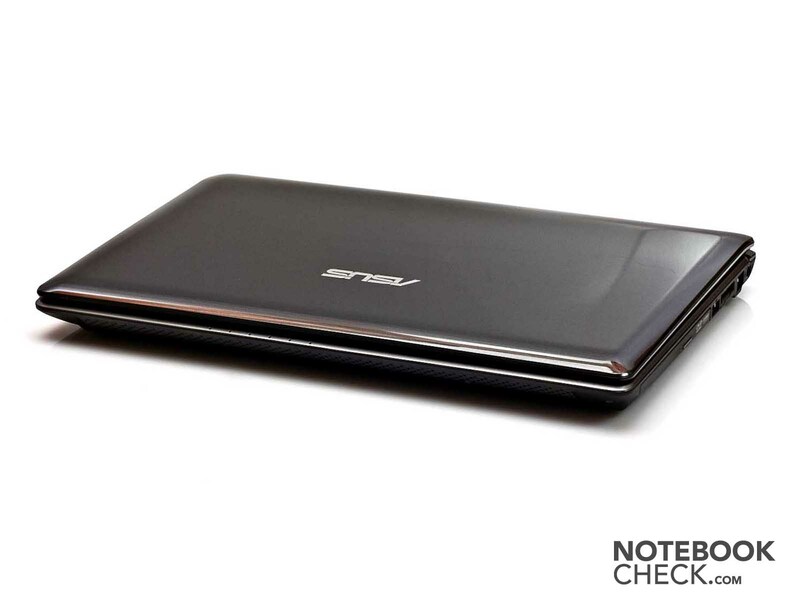 With the A52JU, Asus offers users a thoroughly decent starter notebook. The design and level of craftsmanship are above average for this price range. Except for the keyboard, the notebook doesn't have any major flaws. The performance here naturally does not measure up to that of more expensive multimedia notebooks but offers a good performance for most everyday tasks like office work or internet use. Those with a hankering for games might be disappointed by the Asus A52JU, however. The AMD graphics card can only manage to play most recent games with low detail settings. Black Ops and Bad Company 2 are playable with low details, but A52JU fails miserably at running newer, more resource-demanding first-person shooters. When looking at the notebook for what it is, i.e. 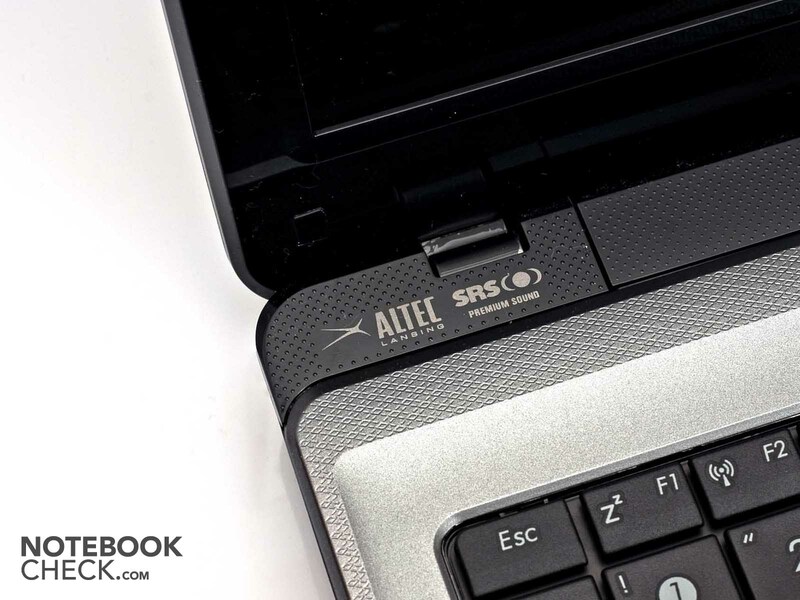 a starter notebook, you can disregard the noisy keyboard and be happy with the Asus A52JU. 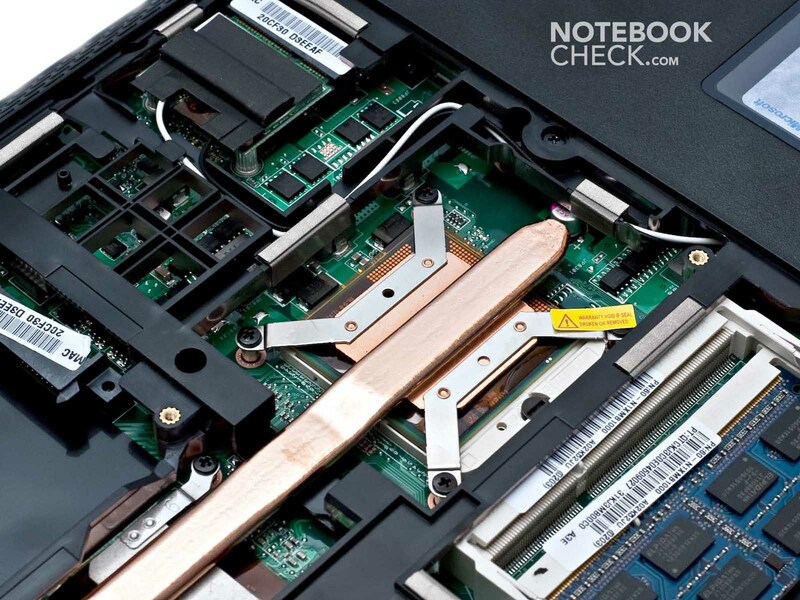 Even the RAM chips are easily within reach. The CPU is cooled by this heatpipe. 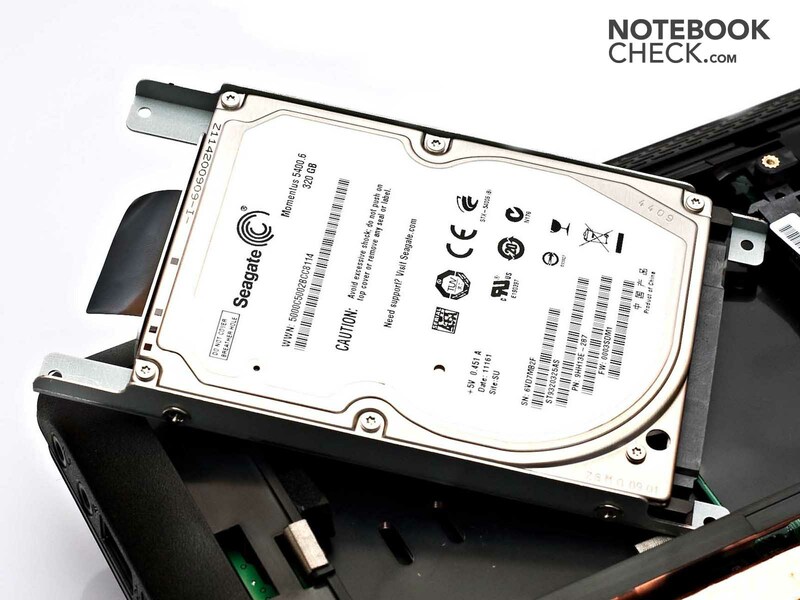 The hard drive can easily be swapped out. Open the hatch to gain access to the hardware. All the status LEDs are found below the touchpad. It wouldn't be complete without the 0.3 megapixel webcam. The surface of the display lid up close. 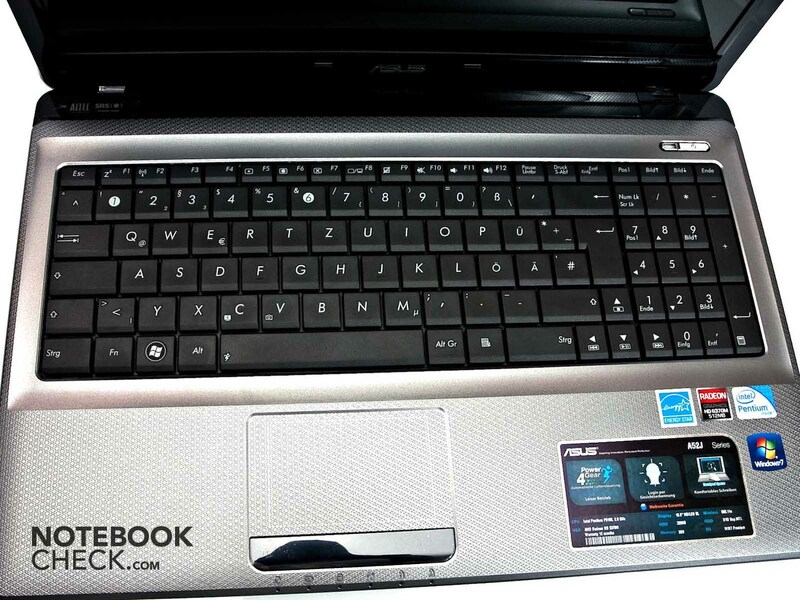 The Asus A52JU even has a number pad. Altec Lansing provided the sound system. Radeon Graphics, ATI is no more. The display lid does not tilt very far back, though. It also looks nice after you open it up. The first thing you notice: the glossy plastic design. 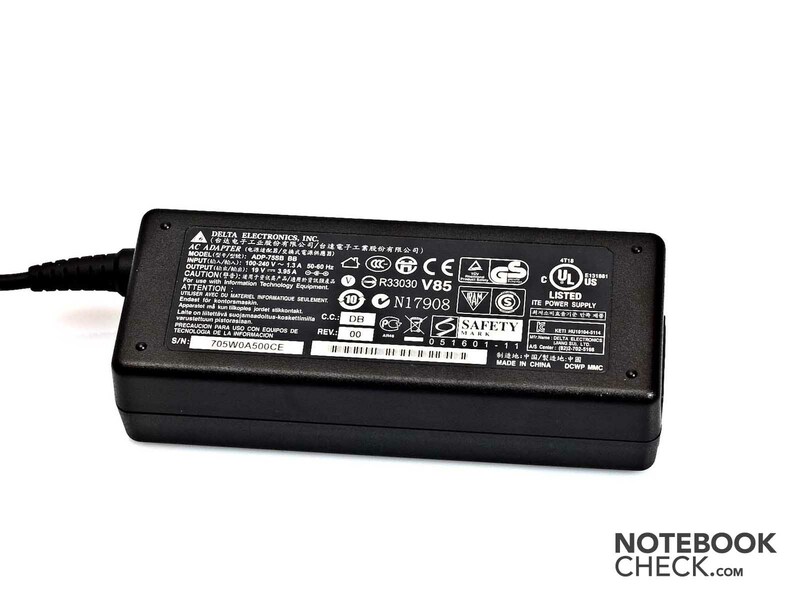 The power supply of the Asus A52JU is quite small and light. The sleek design of the case that needs to be cleaned off often but looks good, and the decent sound system. Another USB port would have done the Asus A52JU some good and Bluetooth would have expanded on the notebook's scope of use. That a keyboard which occasionally misses a keystroke was put in place here. 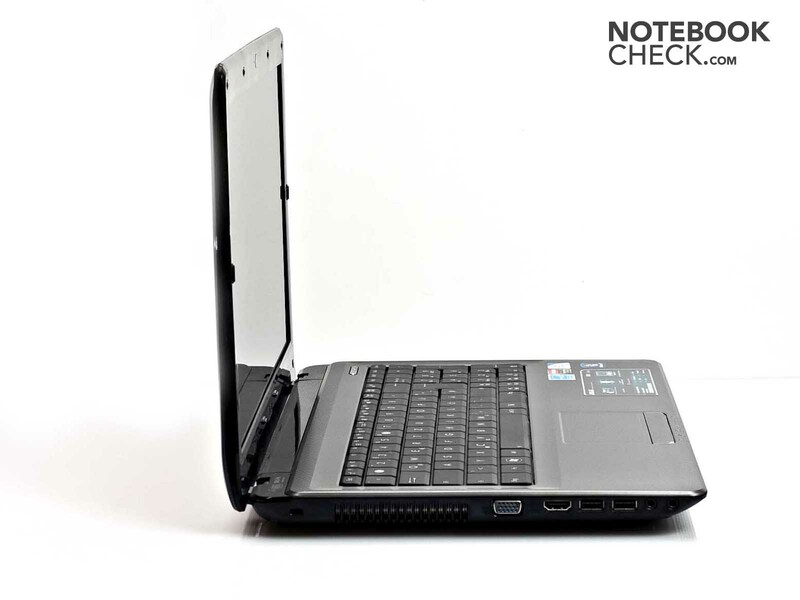 Lenovo's B560 fits within the same price range and offers similar features. The B560, however, has a new Nvidia graphics card and Nvidia Optimus. Another starter notebook would be the Toshiba C660: also with Intel Pentium P6100 but having an Intel HD graphics card. It costs a bit more but has a better keyboard in return.